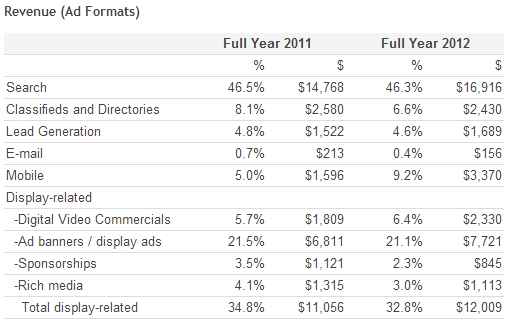 Digital advertising revenues hit a new high in 2012, reaching $36.6 billion according to the newly released IAB Internet Advertising Revenue Report for the full-year of 2012. That record-breaking number is a 15 percent increase over 2011’s full-year revenue number of $31.7 billion, which was also a record. The report reveals that mobile is continuing to gain momentum, because for the second year in a row this channel attained triple-digit growth year-over-year. In fact, mobile grew by 111 percent to 3.4 billion, which comes after 2011’s 149 percent year-over-year growth. In 2012, mobile accounted for 9 percent of total Internet ad revenue. Other highlights show that digital video, which is a part of display-related advertising, also had a significant year-over-year increase of 29 percent in 2012 – bringing in $2.3 billion. Conversely, search revenues accounted for 46 percent of 2012’s total Internet ad revenue, up 14.5 percent and totaling $16.9 billion, while display-related ad revenues grew nearly 9 percent and totaled $12 billion.